Our vision is a community where everyone communicates effectively. 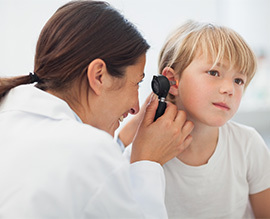 We provide testing and individualized treatment for people of all ages, including early intervention and educational audiology. We listen to you! We help match your lifestyle, hearing loss, and budget to the hearing aid technology that will best help you. We help children and adults develop or regain effective speaking, language, listening, reading, and writing skills. The Community Center for the Deaf & Hard of Hearing (CCDHH) was established in 1975 to meet the diverse needs of the Deaf and Hard of Hearing communities. The Deaf community was looking for services and programs to be provided in American Sign Language (ASL), and hard of hearing individuals sought support and guidance from knowledgeable professionals who could understand their unique challenges. 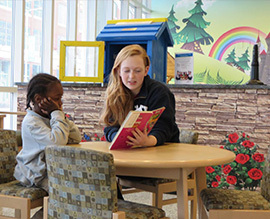 The CCDHH is the only full-service community center for the deaf in Northeast Ohio. Drusilla Marshal’s daughter, Kassidy, was born pre-mature. At six-months-old, her beginning speech sounds seemed normal. But by the time Kassidy turned one, Drusilla noticed her daughter’s speech was hard to understand. With the help of a CHSC speech therapist and the Help Me Grow program, Kassidy was able to learn to communicate using an Augmentative/Alternative Communication (AAC) device. © 2019 Cleveland Hearing & Speech Center. All rights reserved.